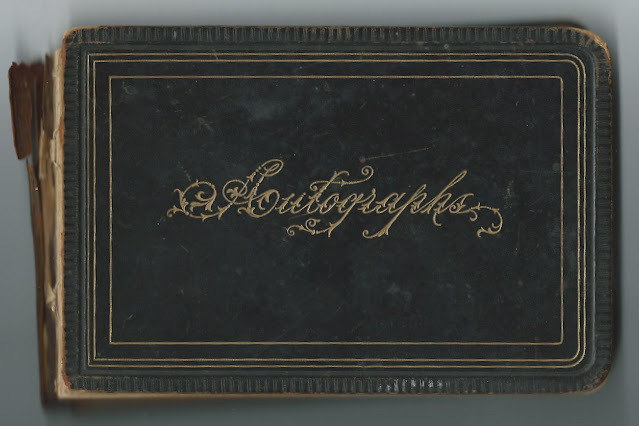 1886-1906 autograph album that belonged to Kansas native Jessie Cassandra Stearns who moved with her family to Skagit County, Washington and attended Northwest Normal School, where many of her signers were fellow students. Northwest Normal School was then at Lynden, Washington, but later moved to Bellingham, Washington, and is now known as Western Washington University. Below, Jessie inscribed a page to her future well wishers. 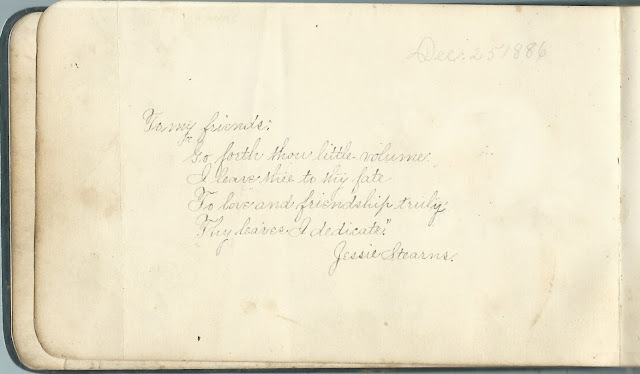 The album measures approximately 7" x 4" and contains the sentiments of 84 of Jessie's relatives, friends, schoolmates and teacher. An alphabetical surname list and an alphabetical list of the signers, together with any personal information they offered, appear at the end of this post. Jessie Cassandra Stearns was born November 20, 1875 at Peru, Kansas, or Sedan, Kansas, the daughter of Earl Herbert Stearns and Margaret Angeline (Clossin/Closson) Stearns, who were born in Pennsylvania and Indiana, respectively. 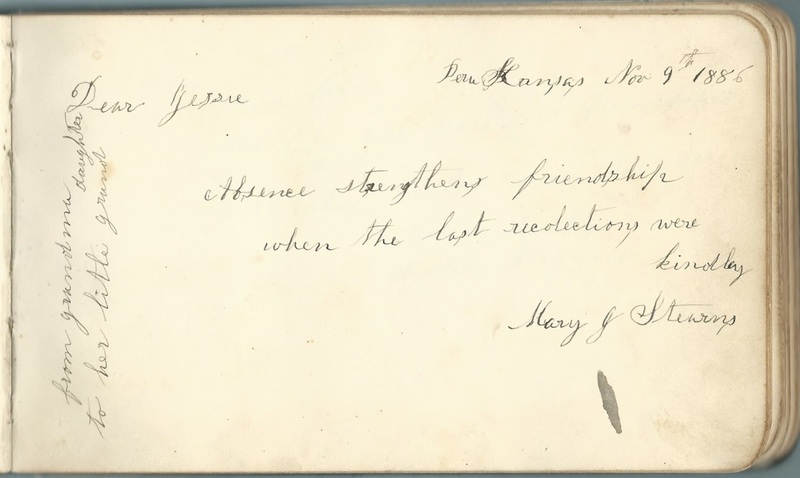 Jessie's paternal grandparents Sheldon Ulysses Stearnes/Stearns and Mary Jocelyn (Monroe) Stearns inscribed facing pages in the album. Jessie had a brother and two sisters. The sisters inscribed pages in the album, Mary Kathryn Stearns, "Kate", at Bay View, Washington on October 28, 1886, and Claudia M. Stearns, "Claudie", at Anacortes, Washington, on February 9, 1906. 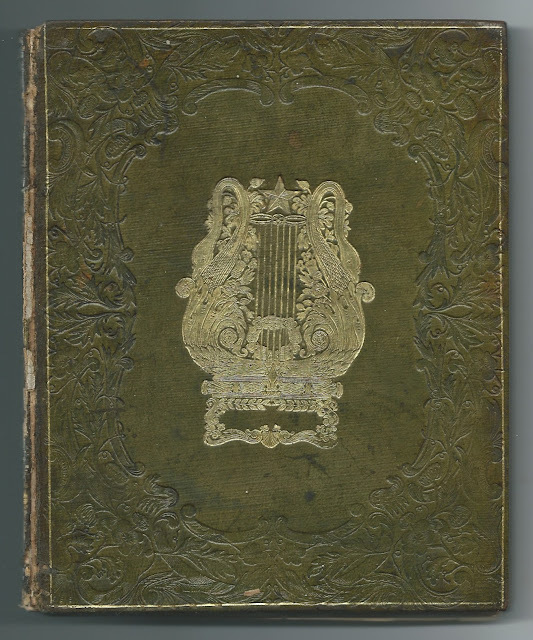 Many other relatives inscribed pages in the album, including members of the Morris, Snook, Stearns and Williamson families, among possibly others; refer to the list of signers below. On February 1, 1897, Jessie Cassandra Stearns married Robert Lee Bradley, son of Valentine and Matilda Josephine (May) Bradley. He was born June 3, 1869 at Oak Harbor, Washington. 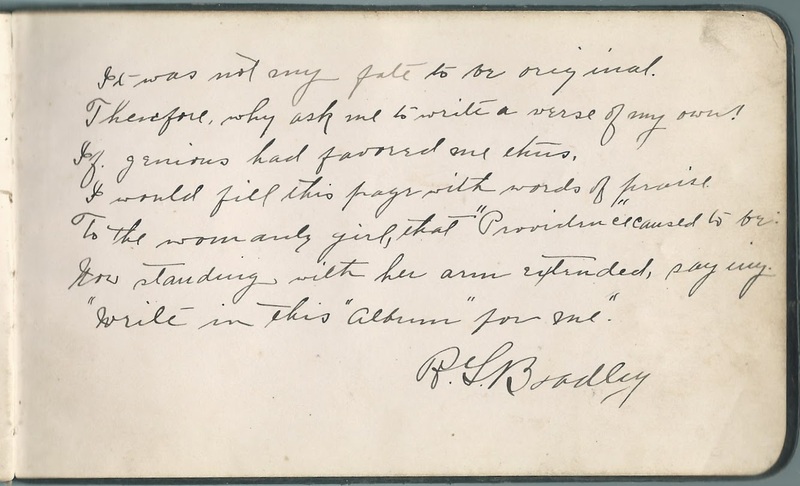 I believe he was the R. L. Bradley, who inscribed the last page in Jessie's album. They settled at Anacortes, Washington. Robert died in 1927, and Jessie in 1959. 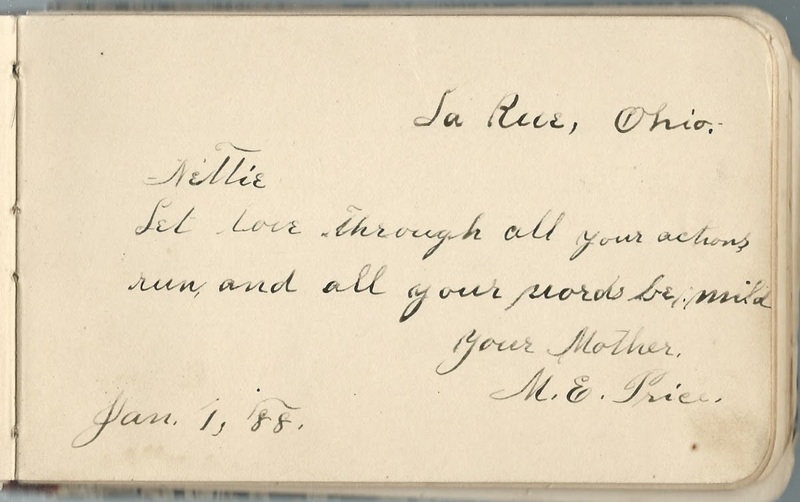 Aunt Phe, signed at Peru, Kansas, on December 5, 1886. Cousin Eva, signed at Washington Territory on August 28, 1887. 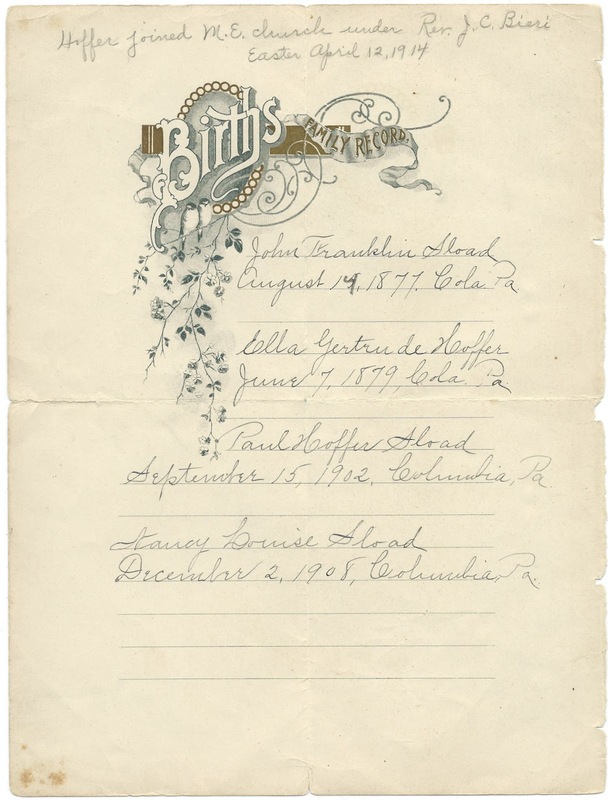 Later note" "Married January 25, 1892 to A. S. Hilton"
Ada M. Bates of Lynden, Washington, signed on January 1, 1892. Ada Margaret (Tennant) Bates, whose third husband James Loring Bates inscribed the right facing page. J. L. Bates, signed on January 1, 1892. 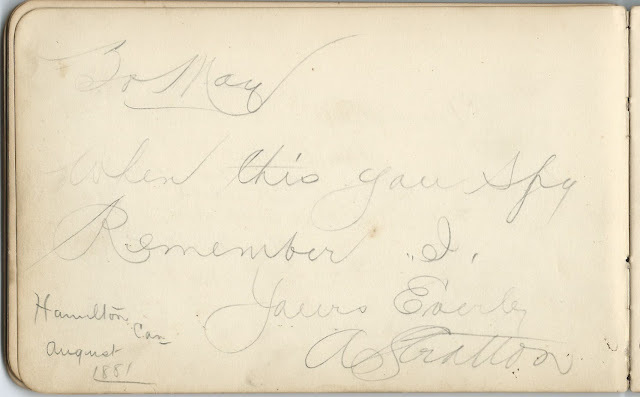 James Loring Bates, whose wife Ada Margaret (Tennant) Bates signed the left facing page. Ada had been married twice before. James may have been married before as well. 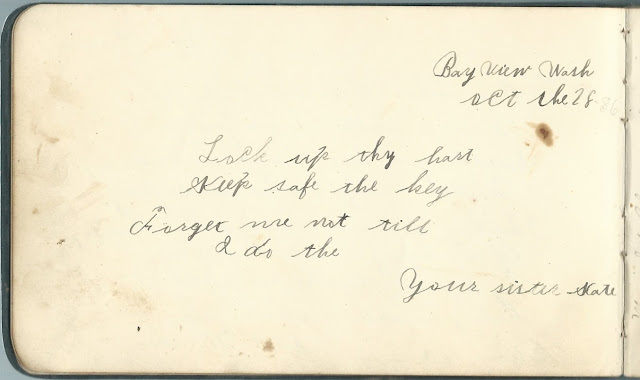 Daisy Boyles, signed at Lynden, Washington, at Northwest Normal School, on December 12, 1891. 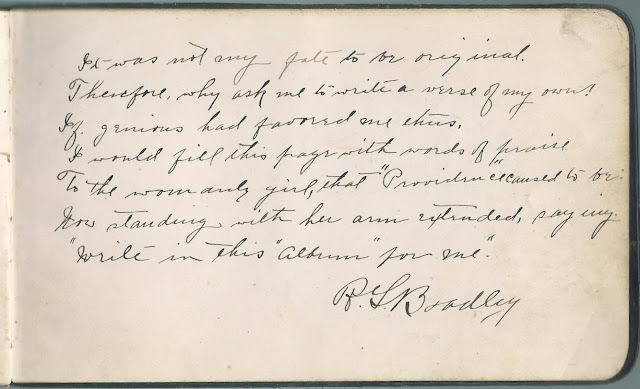 Later note: "Died Feb. 27, 1893"
R. L. Bradley. Presumably Robert Lee Bradley, whom Jessie Cassandra Stearns married about 1897. David Hintz of Custer, Washington, signed on January 21, 1892 at Northwest Normal School Later note: "Married Feb. 1894 to Addie Palmer"
A. M. Holton, signed at Lynden, Washington, on October 23, 1891. Later note: "Married Apr. 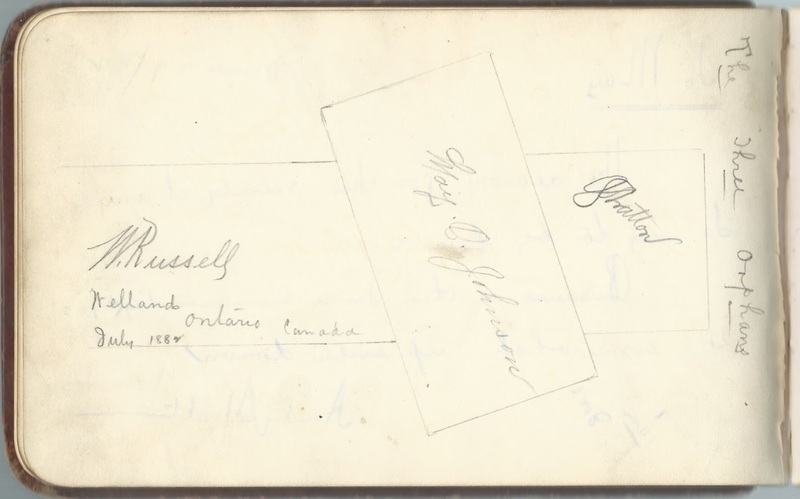 14 1896 to Olive"
Will H. Jackman, signed at Lynden, Washington, on December 11, 1890; Jessie's classmate. 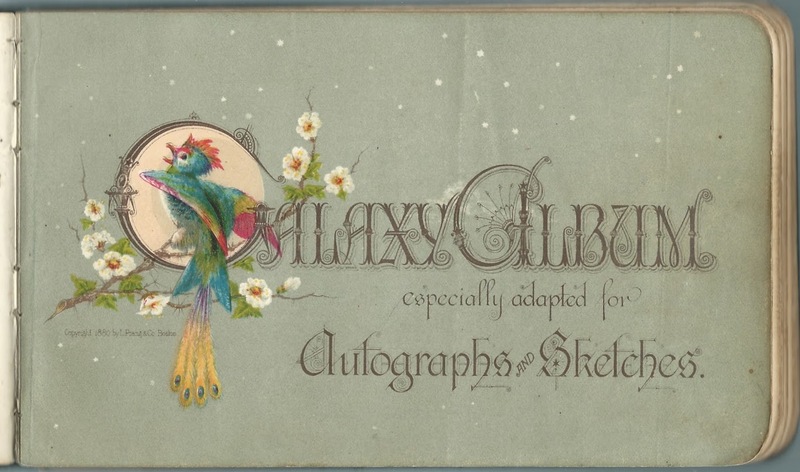 Later note: "Married to Miss Shoemaker - Nov. 1895"
George R. Lindley, signed at Lynden, Washington, on November 19, 1890 at Northwest Normal School. Later note: "Married to Miss Kate"
Cornelia M. Lindley, signed at Lynden, Washington, on November 19, 1890. 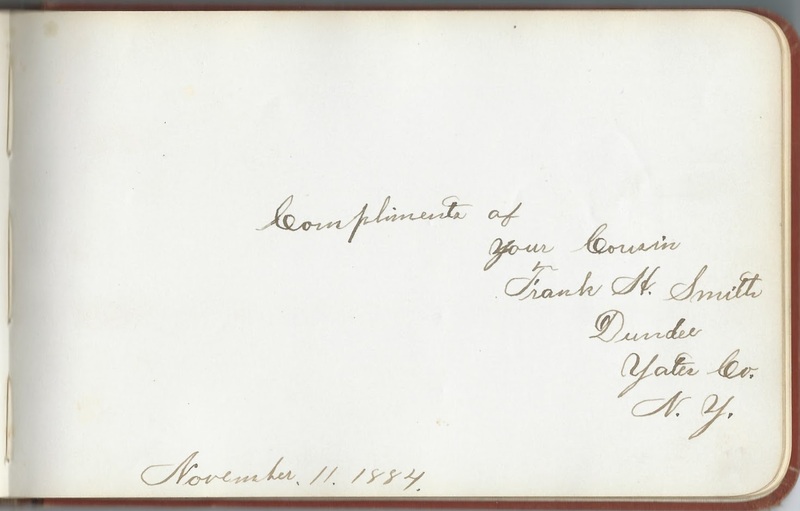 Later note: "Died October 8, 1891"
Louise K. McKenna, signed at Bay View, Washington, on February 21, 1893. "Ever remember our School days at the Bay View College". Later note: :Married Mar. 2, 1895 to C. A. Risbell"
Dollie Mehaffey, signed at Cedar Vale, Kansas, on December 9, 1886. 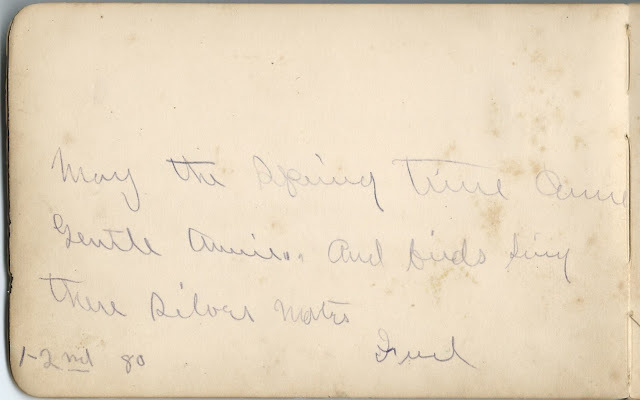 Later note: "Married Dec. 25, 1891"
Charles E. Merritt, signed on January 17, 1892. Later note: "Married". He married Jessie's aunt, Minnie Etta Stearns. Claud Morris, signed at Peru, Kansas. Jessie's cousin, Claude Warren Morris, son of John Warren Morris and Louise Angeline (Stearns) Morris, a sister to Jessie's father Earl Herbert Stearns. May L. Morris, signed at Peru, Kansas, on December 9, 1880; Jessie's cousin May Louise Morris, daughter of John Warren Morris and Louise Angeline (Stearns) Morris, sister of Jennie's father Earl Herbert Stearns. Aunt Louise, signed at Peru, Kansas, on December 9, 1886. She was Louise Angeline (Stearns) Morris, wife of John Warren Morris and sister of Jessie's father Earl Herbert Stearns. Ralph W. Morris, signed at Peru, Kansas, on December 9, 1886. Jessie's cousin, son of John Warren Morris and Louise Angeline (Stearns) Morris, who was a sister of Jessie's father Earl Herbert Stearns. John Morris, signed at Peru, Kansas, on December 10, 1886. Presumably John Warren Morris, who was the husband of Jessie's paternal aunt Louise Angeline (Stearns) Morris. Annie Neville. Later note: "Died June 1888"
Jessie O'Neil, signed at Lynden, Washington, on November 27, 1890. 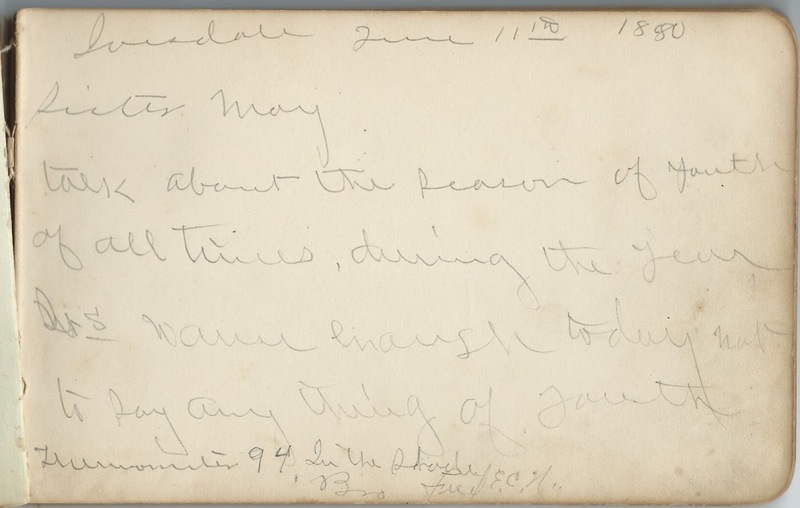 Later note: "Married to Mr."
Addie M. Palmer, signed at Northwest Normal School on October 28, 1891. 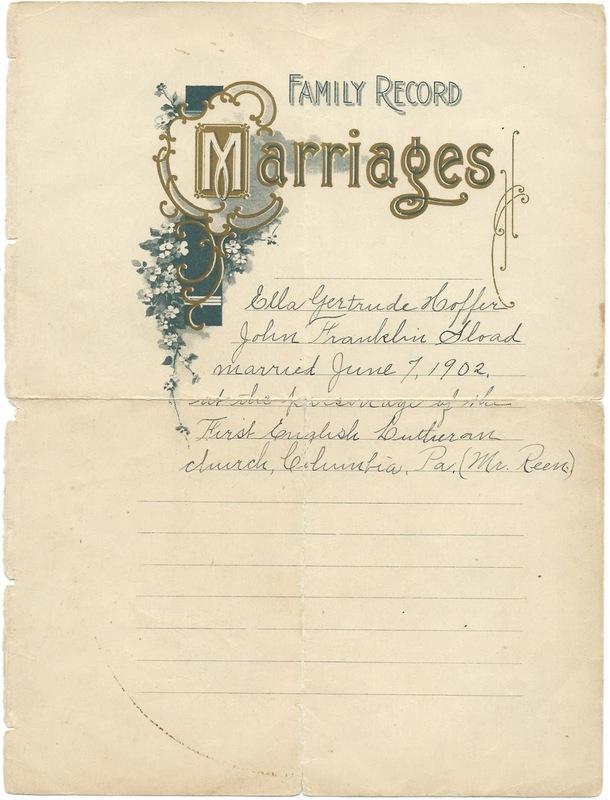 Later note: "Married February 1894 to Dave Hintz"
Laura Penfield of Whatcom, Washington, signed at Northwest Normal School at Lynden, Washington. Later note: "Married to Mr. __ of Iowa"
Emma Robinson, signed at Northwest Normal School at Lynden, Washington, on January 14, 1892. Later note: "Married Feb. 23, 1897 to Rev. 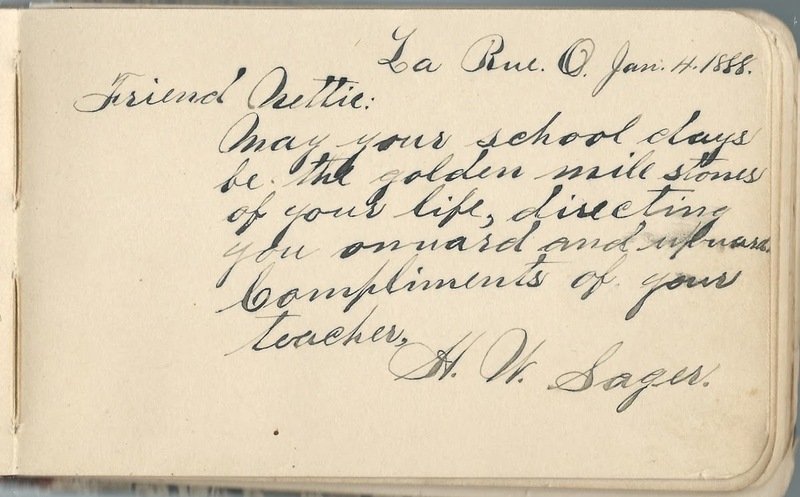 W. Daniels"
Laura Smith of Mountain View, Washington, in Whatcom County, signed at Lynden, Washington at Northwest Normal School on November 1, 1890; Jessie's schoolmate. 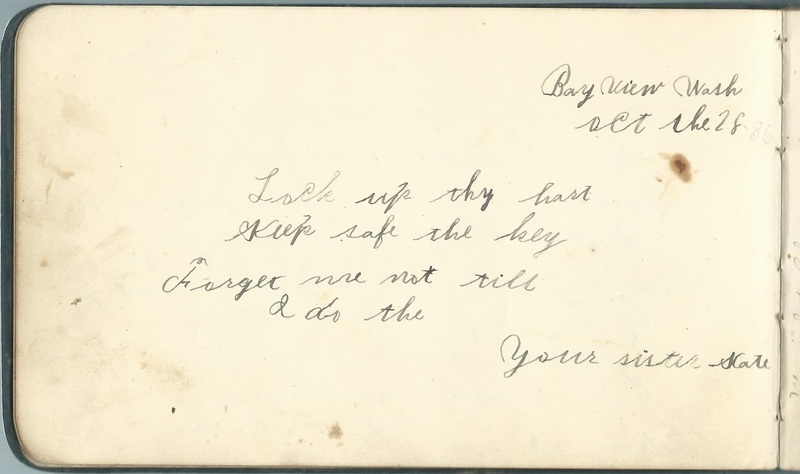 Meg Snook, signed at Bay View, Washington, on August 24, 1891; Jessie's cousin. Later note: "Married Sep. 22, 1893 to J. P. Johnston". Presumably Mary Margretta (Snook) Johnston, daughter of John Summers Snook and Ellen Orinda (Stearns) Snook, who was a sister to Jessie's father Earl Herbert Stearns. 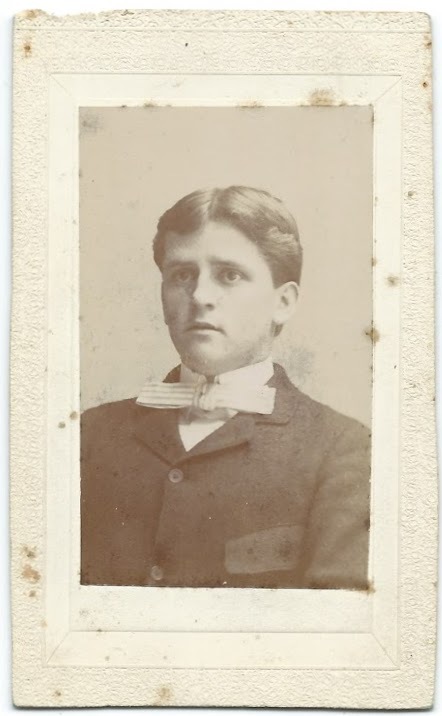 Bertie Snook, signed at Peru, Kansas, on May 4, 1888; Jessie's cousin. Presumably Silas Herbert Snook, whose mother was Ellen Orinda (Stearns) Shook, a sister to Jessie's father Earl Herbert Stearns. Gertie Snook, signed at Bay View, Washington Territory, on May 4, 1889; Jessie's cousin. Presumably Cora Gertrude Snook, daughter of John Summers Snook and Ellen Orinda (Stearns) Snook, who was a sister to Jessie's father Earl Herbert Stearns. Later note: Married May 22, 1892 to H. H. Dean"
Jessie Cassandra Stearns of Kansas and Washington; album owner. She apparently received the album at Christmas in 1886 and wrote a page to her future well wishers. 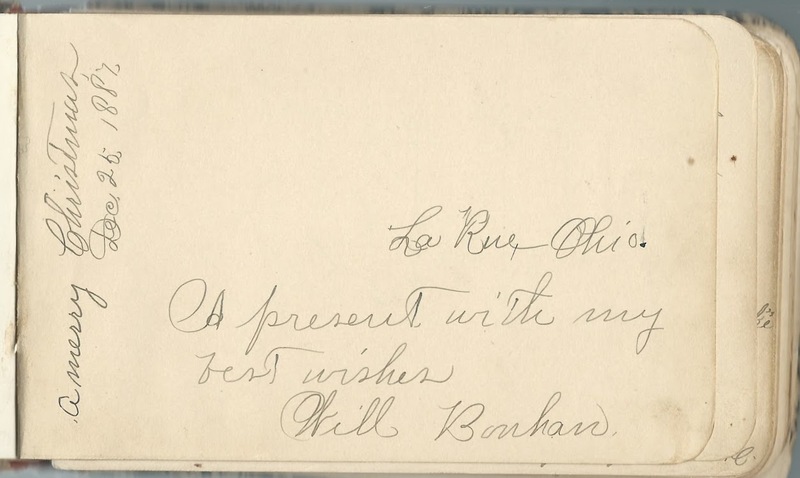 Aunt Blanche, signed at Peru, Kansas, at Christmas in 1886. Later note: "Married June 1, 1887 S. G. Buell". She was Julia Blanche Stearns, future wife of Sylvester Greider Buell. 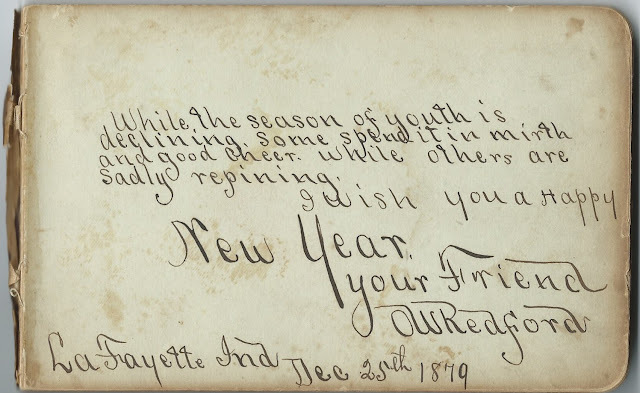 Sister Kate, signed at Bay View, Washington, on October 28, 1886. Mary Kathryn Stearns, Jessie's younger sister, who would marry Charles Elmer [or Esley] McCullough about 1905. Aunt Etta, signed at Peru, Kansas, on December 3, 1886. Later note: "Married to Chas. Merritt Oct. 19 - '92". She was Minnie Etta Stearns, who married Charles Elmer Merritt [or Charles Esley Merritt] as noted. Mary J. Stearns, signed at Peru, Kansas, on November 9, 1886. 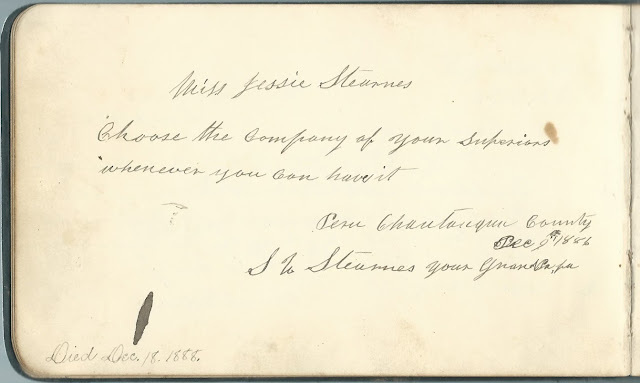 Jessie's grandmother Mary Jocelyn (Monroe) Stearns, whose husband Sheldon Ulysses Stearns signed the left facing page. Willie Stearns, signed on November 6, 1886. 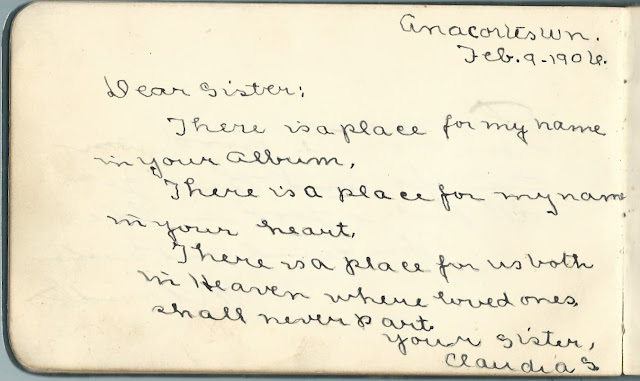 Later note: "Died July 18, 1890"
Claudia S., signed at Anacortes, Washington, on February 9, 1906. 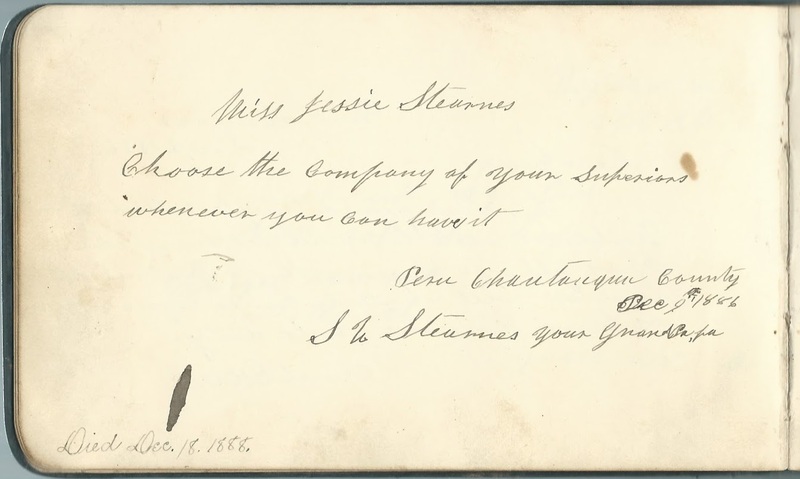 Jessie's younger sister Claudia Stearns, "Claudie"
Hessie Stearns, signed at Peru, Kansas, on December 5, 1886. Hessie Jane (Cain) Stearns, wife of signer George Mageline Stearns. 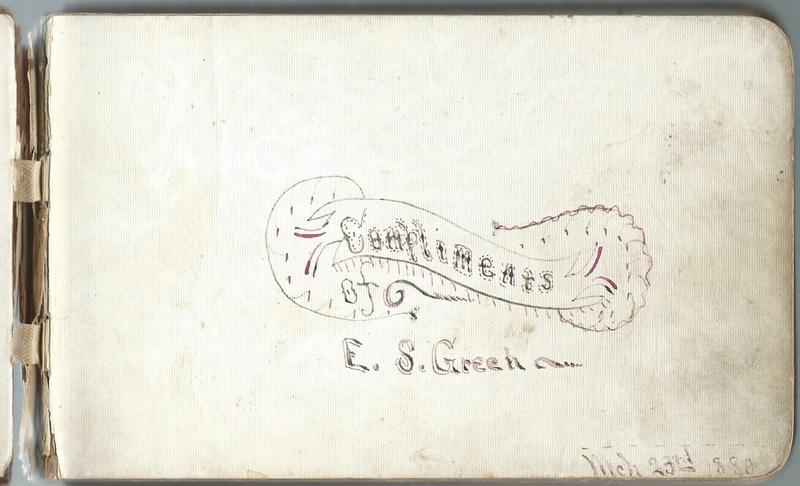 G. M. Stearns of Peru, Kansas, signed in December 1886. Presumably George Mageline Stearns, husband of signer Hessie Jane (Cain) Stearns. 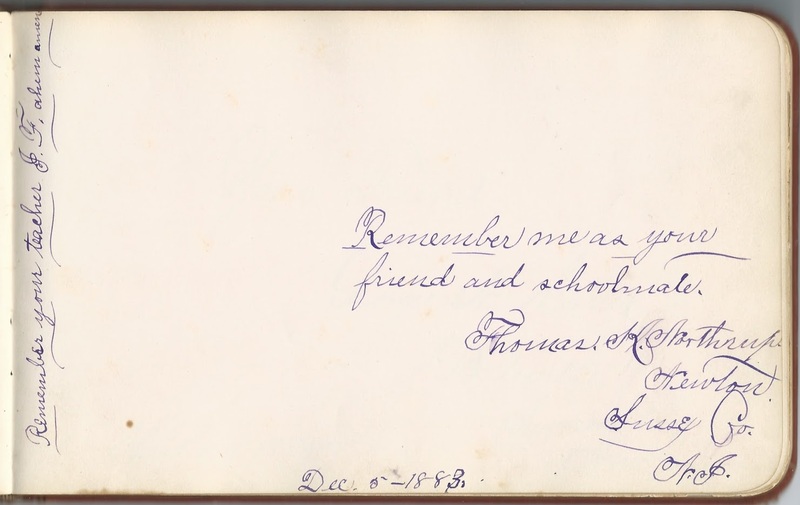 W. L. Trice, signed at Northwest Normal School, on Lynden, Washington, on November 11, 1890. Not sure of surname. 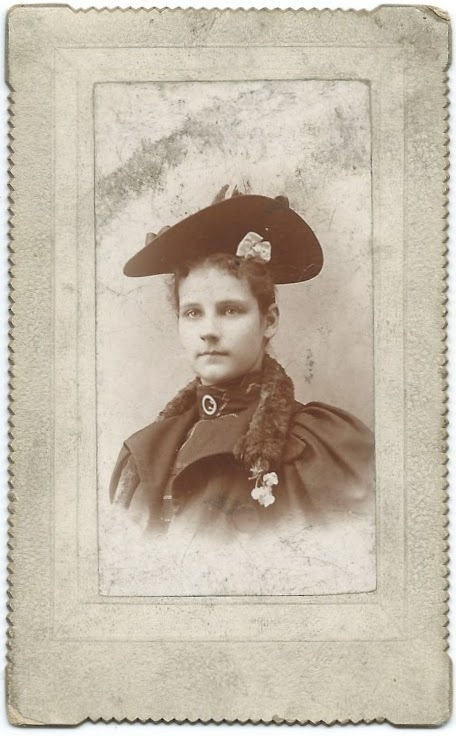 Della Woody, signed on October 30, 1891; Jessie's schoolmate. 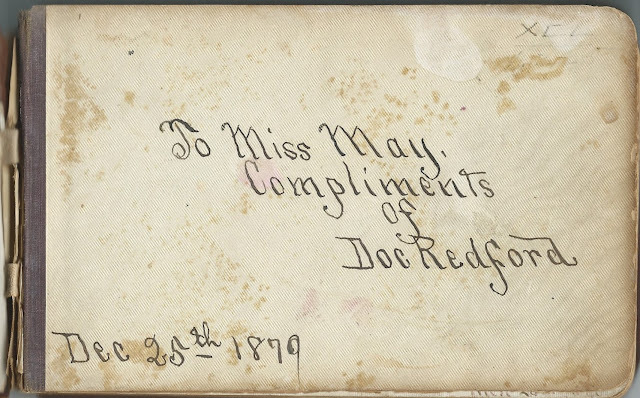 Later note: "Married in September 1891 to Mr. York"
1882-1889 autograph album that belonged to an Ira, who was a student at Newton College Institute during part of that time frame. Please refer to the comments section where a reader has provided convincing evidence that Ira was Ira P. Smith, son of Peter and Eliza (McDavit) Smith. There are two clues to Ira's identity in the album. One is that Frank H. Smith of Dundee, New York, who inscribed a page on November 11, 1884, called himself Ira's cousin. 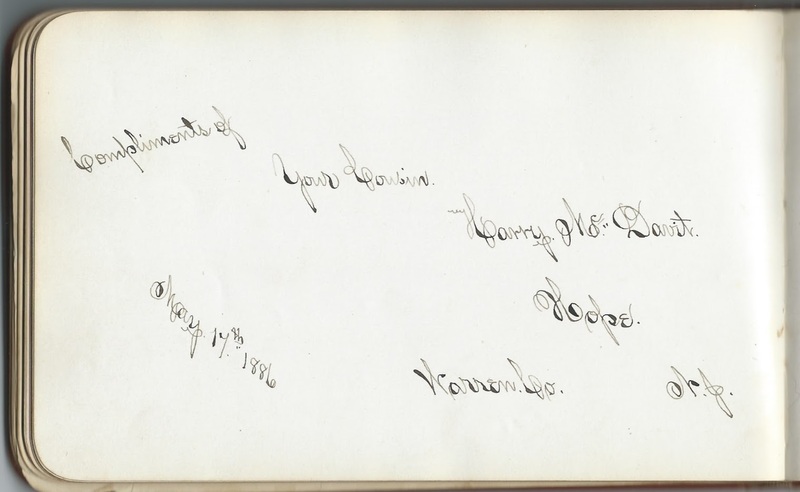 Another cousin, Harry McDavit of Hope, New Jersey, inscribed a page on May 17, 1886. 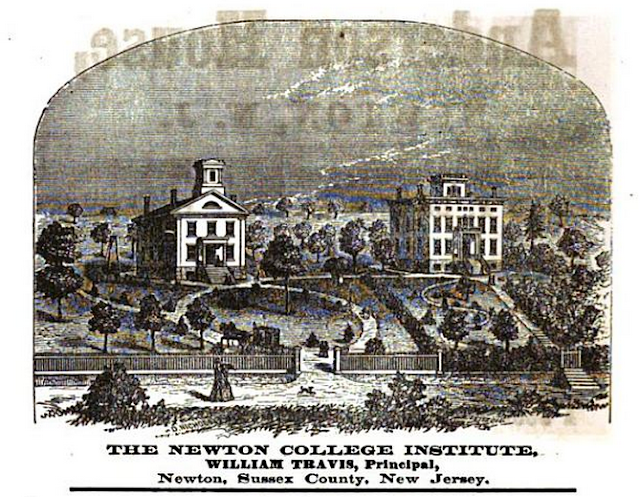 One student at Newton College Institute, Thomas K. Northrup of Newton, New Jersey, who inscribed a page on December 5, 1883, referred to a teacher "J. F." Two other people named Northrup inscribed pages in the album; refer to the list below. If you have a theory as to Ira's identity, please leave a comment or contact me directly. 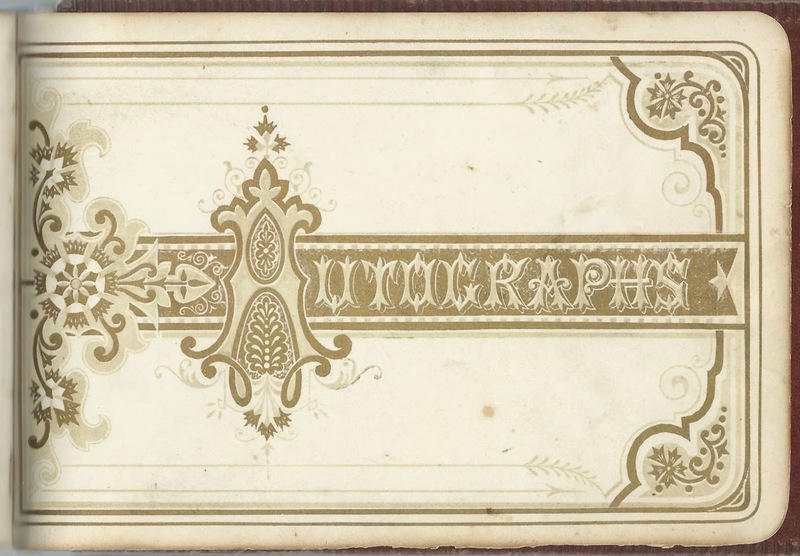 Thomas K. Northrup of Newton, New Jersey, signed on December 5, 1883. "Remember your teacher J. F."
John Pinckney of Newton, New Jersey, signed on February 2, 1883; middle initial might be S or L.
Benjamin F. Worley of St. Paul, Minnesota, signed at Newton College Institute, on "2-1-83"
John E. Young, signed on February 31, 1883 at Newton College Institute; the date was often used as a joke. 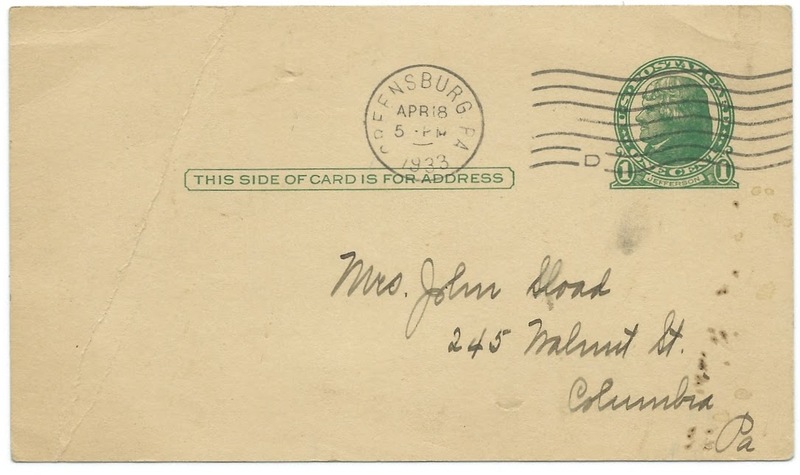 Small archive of items pertaining to John Franklin Sload and his wife Ella Gertrude (Hoffer) Sload of Columbia, Pennsylvania and, later, Lancaster, Pennsylvania. Above, photograph of John as a boy; below, reverse of the photograph. Photograph of Ella Gertrude (Hoffer) Sload as a girl. Their marriage on a page that may have been removed from a Family Bible. 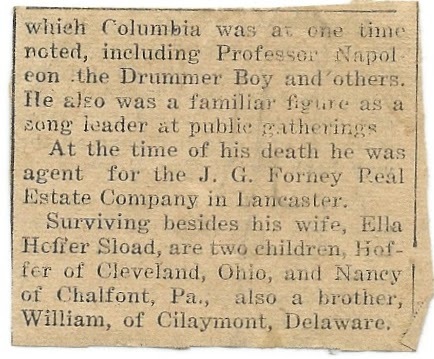 The reverse of the page above, showing birth dates for John and Ella, as well as two of their children, all born at Columbia, Pennsylvania. 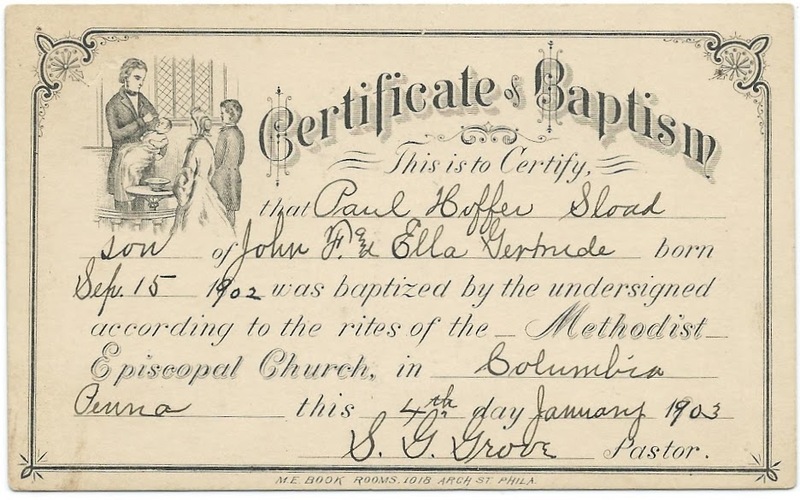 Baptism Certificate for their son Paul Hoffer Sload, born September 15, 1902 and baptized at Columbia, Pennsylvania, by Pastor S. G. Grove, on January 4, 1903. The final item is John Franklin Sload's obituary from Lancaster, Pennsylvania, where he died in 1952, after residing there for the last ten years of his life. John Franklin Sload was born August 14, 1877 at Columbia, Pennsylvania, the son of John and Anna Mary (Miller) Sload. Ella Gertrude (Hoffer) Sload was born June 7, 1879 at Columbia, Pennsylvania, the daughter of Jacob Zollinger Hoffer and Sarah Jane (Grove) Hoffer. I wonder if the pastor who baptized Ella's son, S. G. Grove, was a relative on Ella's mother's side. 1838-1840 autograph album that belonged originally to Jane C. Donnell of Alna, Maine. 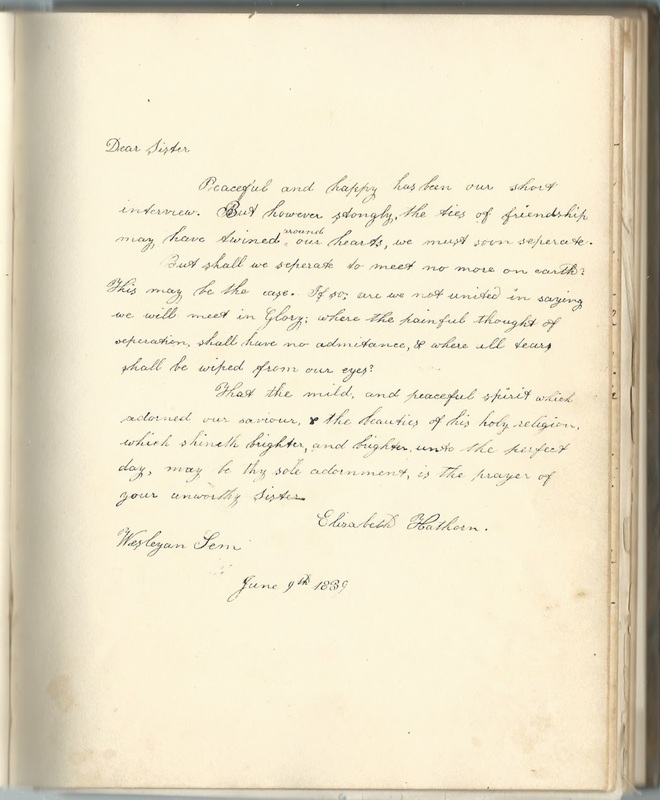 Many of the sentiments were left by Jane's fellow students at Maine Wesleyan Seminary in Readfield, Maine, still operating today as the Kents Hill School, perhaps the oldest continuously operating co-educational school in the nation. Sadly, Jane died when she was only 20. The album then apparently passed to her namesake niece Jane C. (Donnell), White, "Jennie", daughter of Benjamin Woodbridge Donnell and Frances Lucinda (Cone) Donnell." And then into the possession of Jennie's daughter Florence Donnell White, whose father was Henry Kirke White. 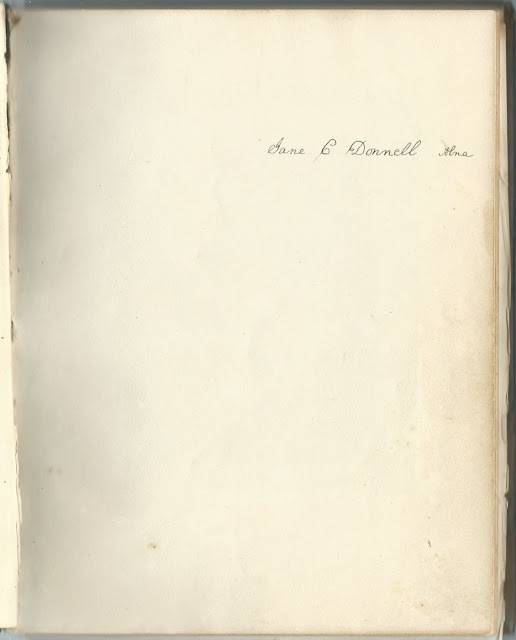 Incidentally, I found that a Jennie Donnell attended Maine Wesleyan Seminary in the 1870s; perhaps attending the school was a family tradition. If three owners weren't enough, there's an undated paper tucked in the album that appears to show where the album was presented to a Mary, whether related to the original family or not. All of the sentiments, however, appear to date from the original owner's possession in the period from 1838 to 1840. Florence stamped her name on two of the front end papers, the second of which also had the name J. C. Donnell in pencil, which leads me to believe it referred to Florence's mother Jennie's term of ownership rather than Jane's. The name on the following end paper was, I believe, written by the original owner Jane. 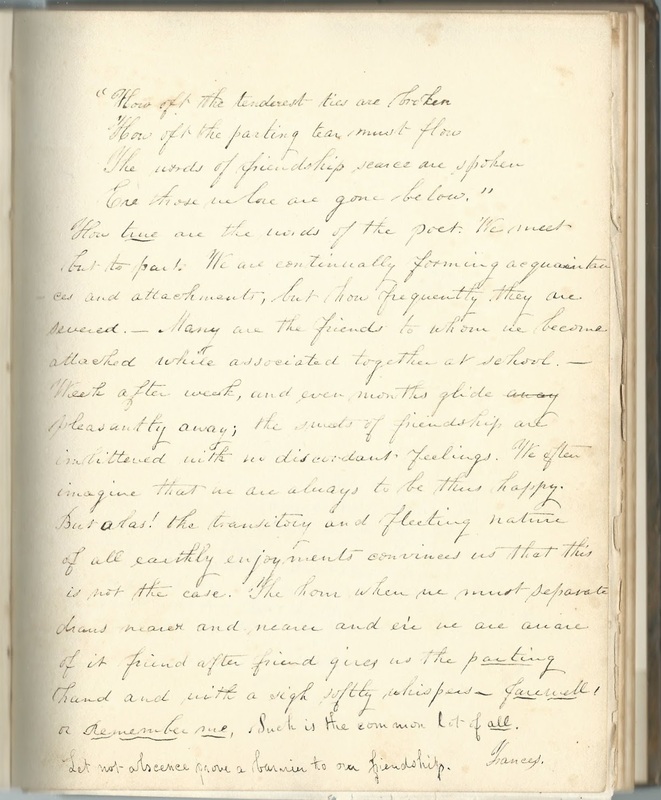 The album measures approximately 7-3/4" x 6-1/4" and contains the sentiments of 21 of Jane's friends and schoolmates. 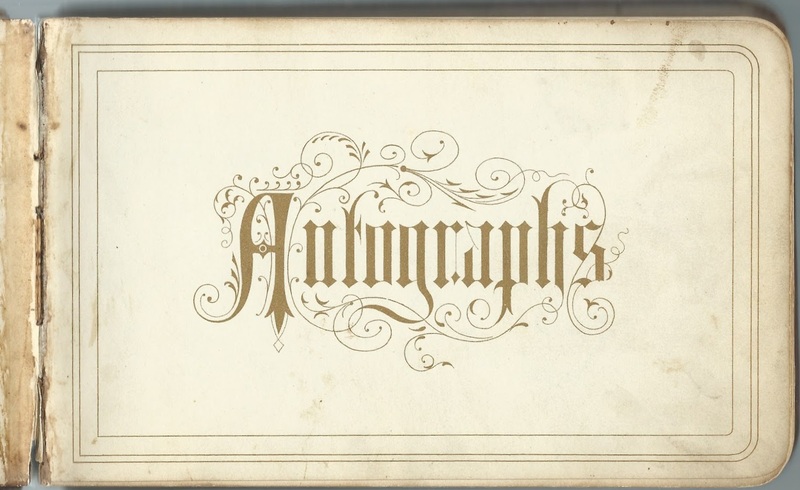 An alphabetical list of surnames and an alphabetical list of the signers, together with any personal information they offered, appear at the end of this post. Jane C. Donnell was born July 8, 1821 at Alna, Maine, the daughter of Jotham and Jane (Woodbridge) Donnell, who were both born at nearby Newcastle, Maine. Jane apparently attended Maine Wesleyan Seminary in 1839. I don't know if she had a chance to put her education to good use before her death on February 26, 1842. One of the pages was signed by a Frances, who might have been Frances Lucinda (Cone) Donnell, wife of Benjamin Woodbridge Donnell and mother of Jane's niece Jennie C. (Donnell) White. 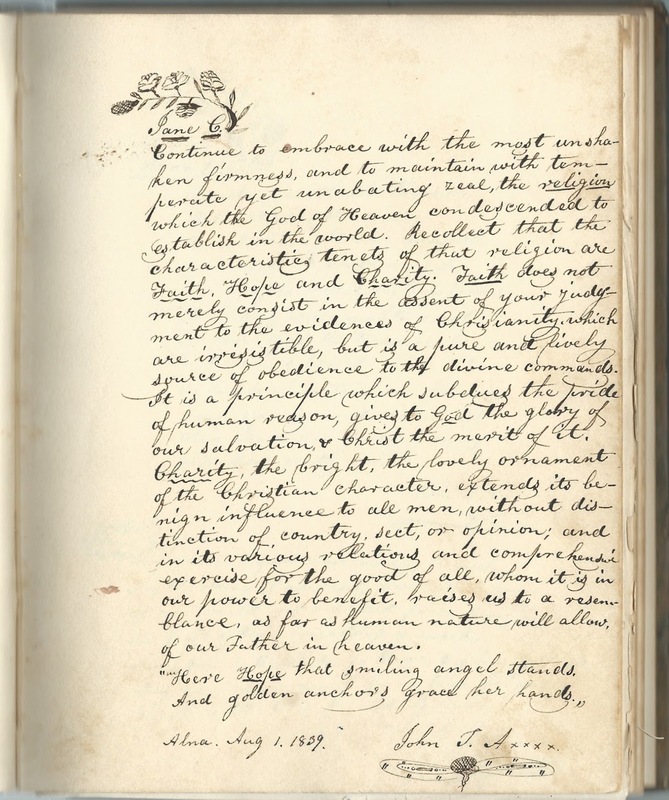 One signer, Elizabeth Hathorn, who inscribed a page at Wesleyan Seminary on June 9, 1839, mentioned that she was Jane's sister, but the relationship was as a religious or social one. I wonder if the John T. A., who inscribed two pages was Dr. John T. Achorn of Alna, Maine. If you have corrections and/or additions to the information above, or information on any of the signers listed below, especially if you can identify some of the people who signed with initials, please leave a comment or contact me directly. 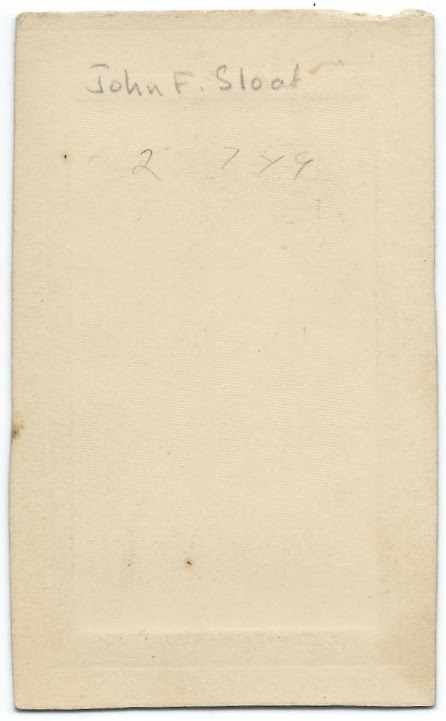 Signed by W at Boston, Massachusetts, on January 1, 1840. Page has a small engraving on it. 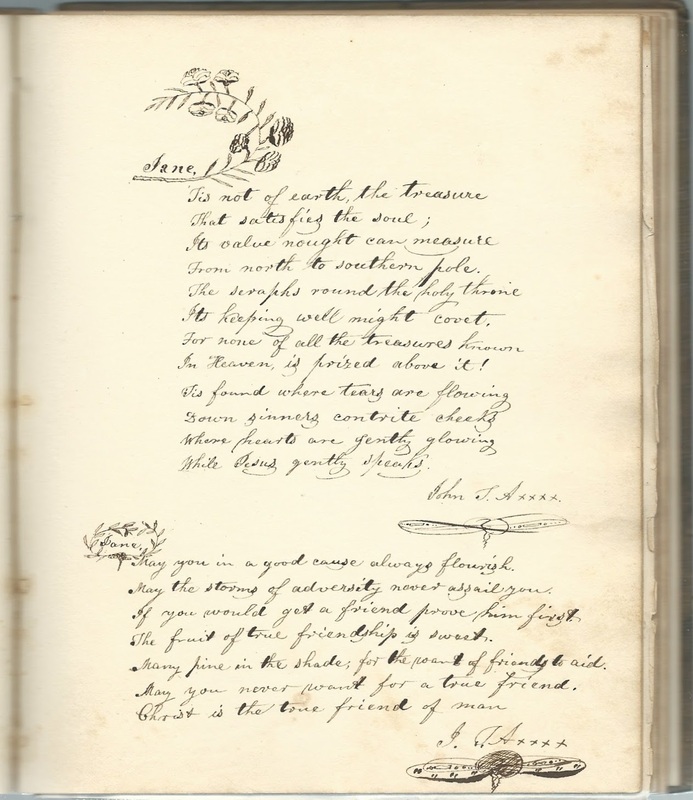 John T. A., signed at Alna, Maine, on August 1, 1839; possibly John T. Achorn. He signed another page as well. 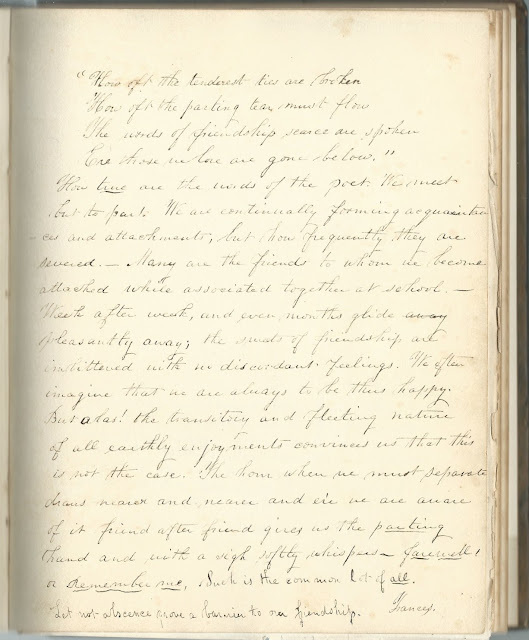 2-page sentiment; initials, signed at Wesleyan Mansion, on June 7, 1839. Middle initial likely an S, and surname initial a C.
? D. Clifford, signed at North Edgecomb, on September 17, 1839; given name initial might be S, T, I, J or ? Elizabeth Hathorn, signed at Wesleyan Seminary on June 9. 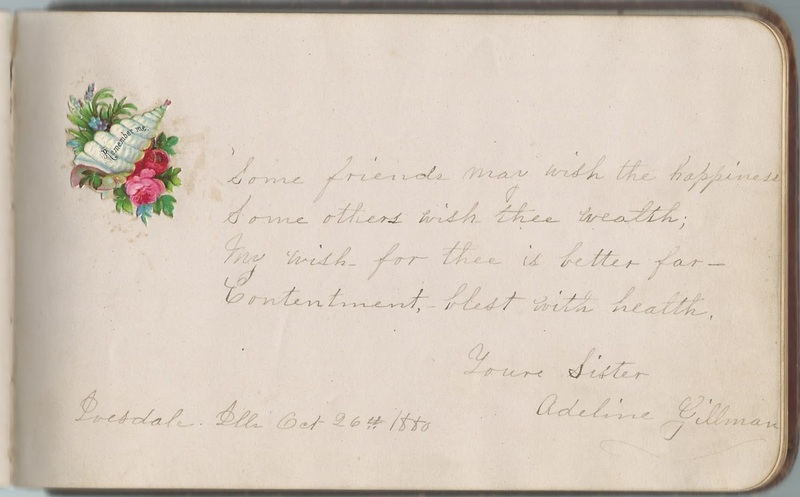 1839; "Dear Sister". Presumably Elizabeth meant that she was a religious or social sister. Florence Donnell White, grand niece of original album owner Jane C. Donnell. 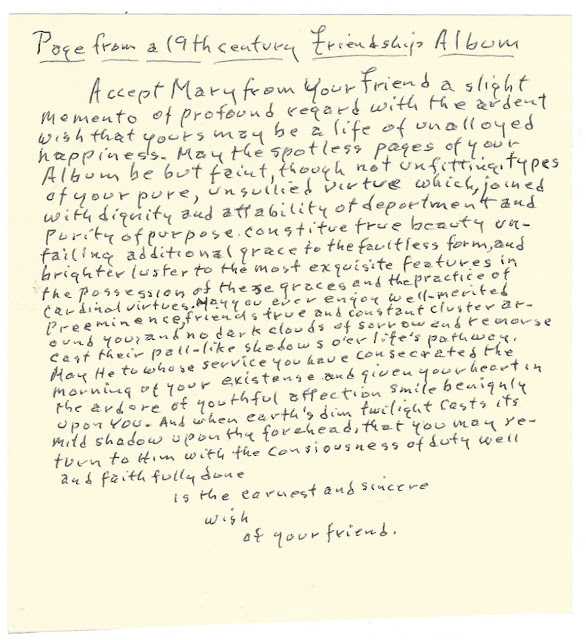 Florence's name is stamped on two pages at the beginning of the album, and it appears that the album eventually passed into her hands. She was the daughter of Henry Kirke White and Jane C. (Donnell) White, "Jennie", who was the niece and namesake of the original owner. 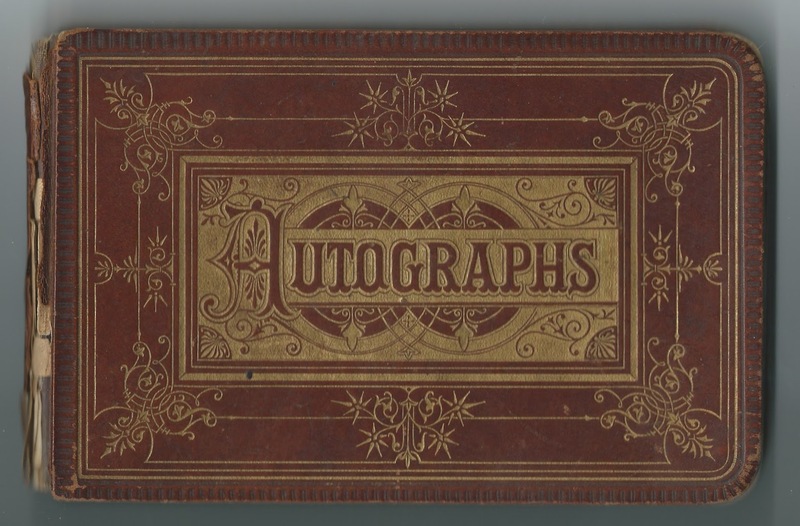 1880s autograph album that belonged to May Ola Johnson of Ivesdale, Illinois. See another post that features an autograph album presented to May at Christmas in 1879 by "Doc" Redford. 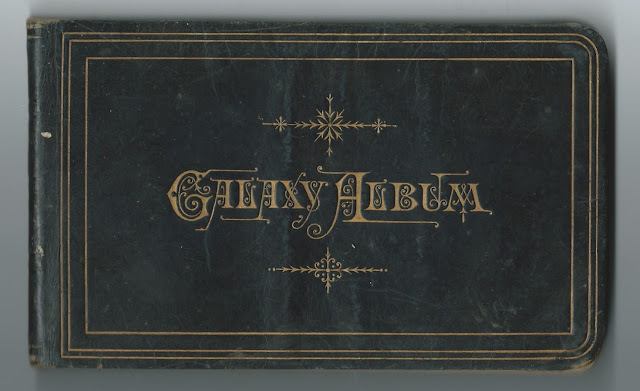 The album was presented to May by E. S. Green, presumably as a birthday present, on March 23, 1880. I found a reference online that gives May's birthday as March 24, but it could have been March 23, or perhaps the birthday celebration was held a day earlier. The album measures approximately 7-1/2" x 4-1/2" and contains the sentiments of about 30 of May's relatives and friends. 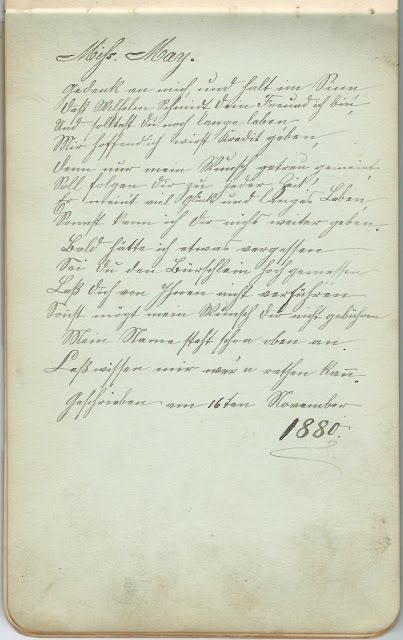 An alphabetical surname list and an alphabetical list of the signers, together with any personal information they offered, appear at the end of this post. 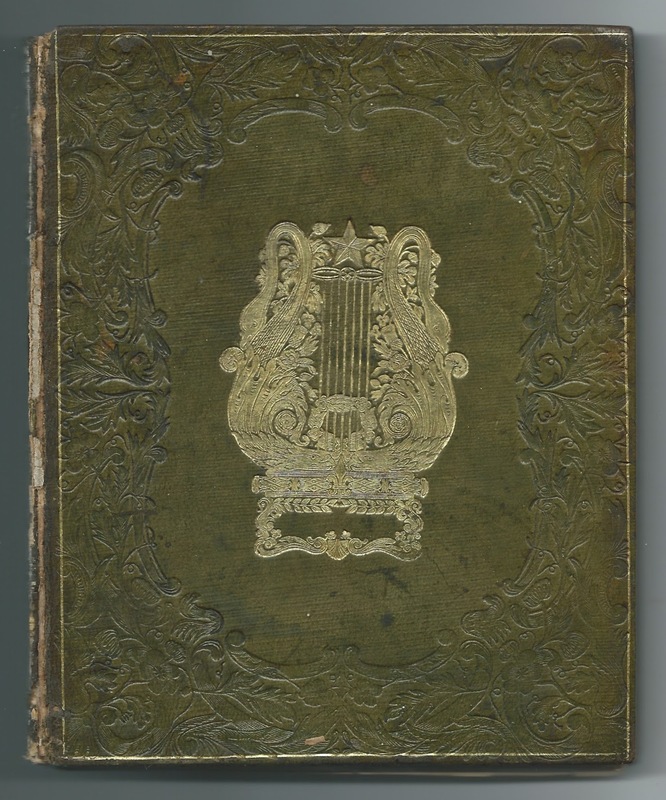 Some of them inscribed pages in the other album as well. May Ola Johnson was born March 24, 1862 at Ivesdale, Illinois, the daughter of William Henry Johnson and second wife Catherine Louisa Rosenplanther, who were born in Massachusetts and Germany, respectively. May's father, William Henry Johnson, the son of Enoch and Lydia (Purinton) Johnson, was first married to Catherine Leagle, who died in 1849 after having at least three children. 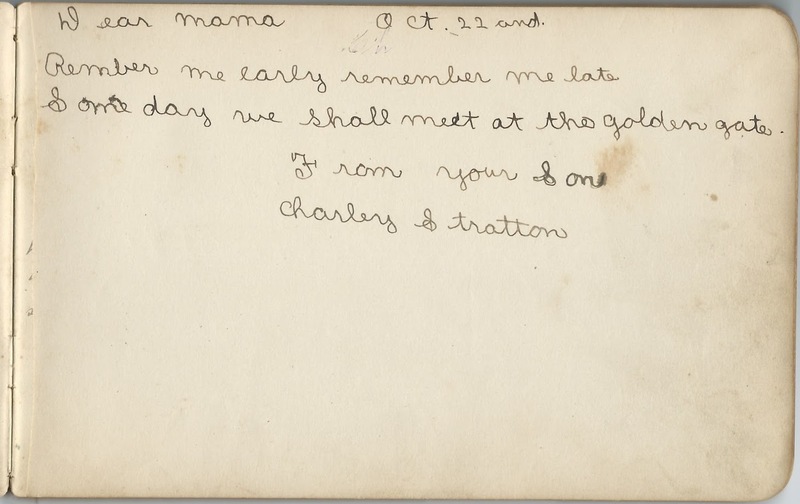 I believe it was one of these children, Adeline (Johnson) Gillman, who inscribed a page in her younger half-sister May's album on October 26, 1880 at Ivesdale, Illinois. Her daughter Minnie, with husband James Gillman, also inscribed a page; Minnie gave her name as Gilman. About 1891, May Ola Johnson married Andrew Stratton, son of Thomas and Margaret (Pringle) Stratton. Andrew was born at Hamilton, Ontario, on June 30, 1855. 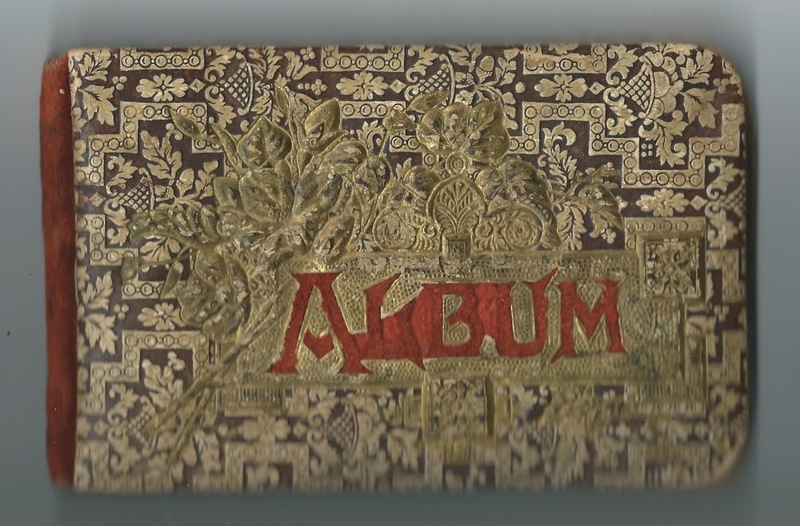 He inscribed several pages in the other album and two pages in this album in June and July 1882, one of which had May's name on it. May and Andrew had two children, Charles Stratton and Louisa M. Stratton. "Charley" signed a page in the other album. Sadly he died in his teens. Louisa, thankfully, lived a long life. Andrew died in 1927, and May in 1953. E. S. G. or E. S. Y. 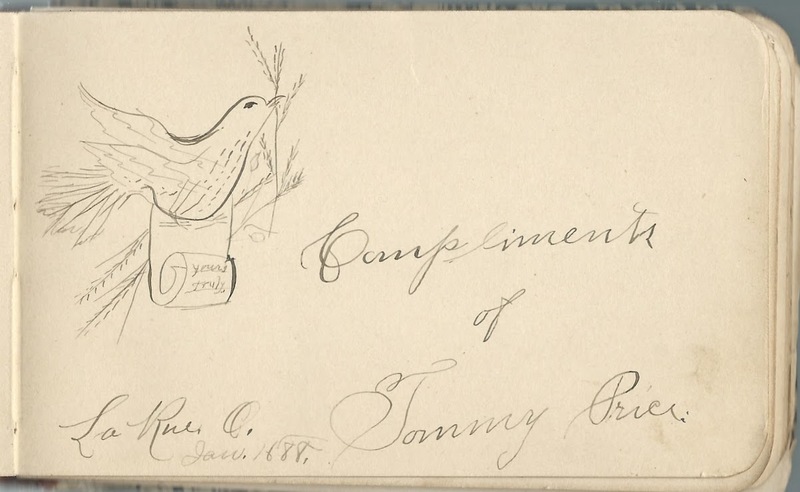 "Blondy & Tippy"; shared the page with Libby E. Heyman; Ed Rothstein; E. J. Heyman; and May Ola Johnson, who wrote her name in the center of the page. 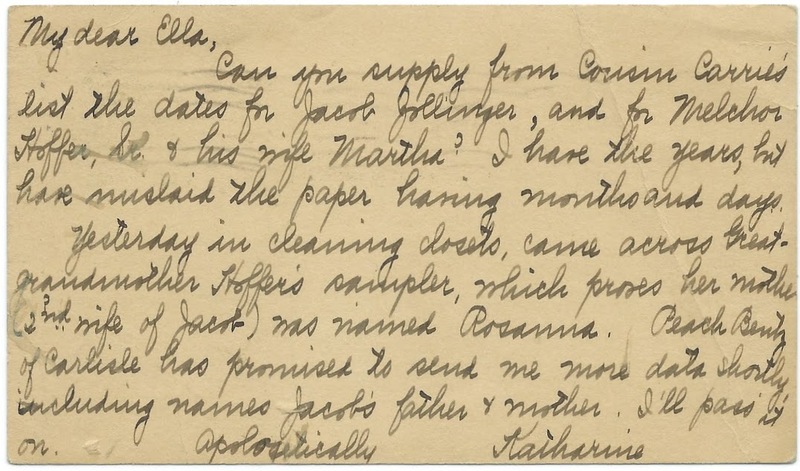 Jennie M. Culbertson, signed at Tolono, Illinois, on "4-12-1880"
Adeline Gillman, signed at Ivesdale, Illinois, on October 26, 1880; "Your Sister". May's older half-sister Adeline (Johnson) Gillman, wife of James Gillman. 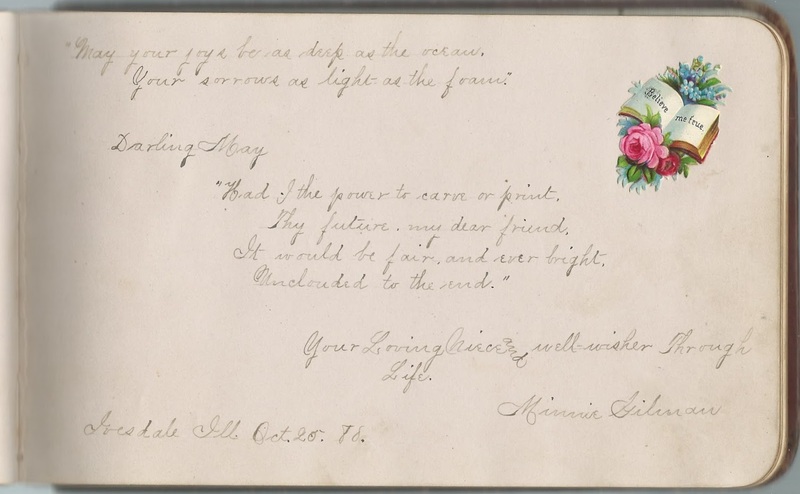 Minnie Gilman, signed on Ivesdale, Illinois, on October 25, 1880; "Your Loving Niece". Minnie Gillman [usually spelled with two "l"s], daughter of May's older half sister Adeline (Johnson) Gillman and her husband James Gillman. 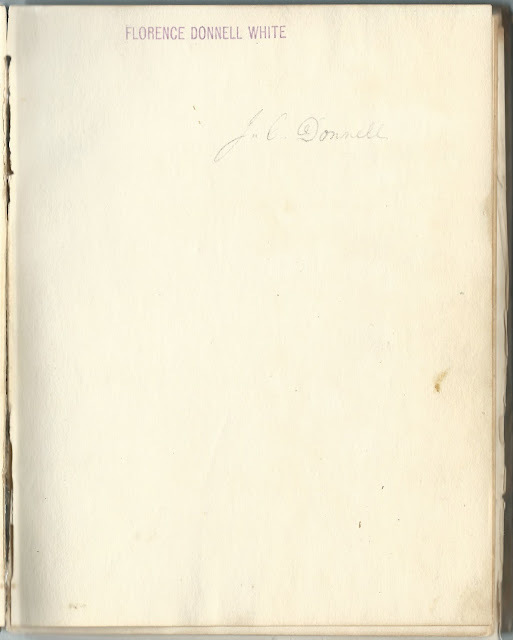 Edy J. H., signed on December 22, 1882; presumably Edy J. Heyman who might have inscribed other pages. 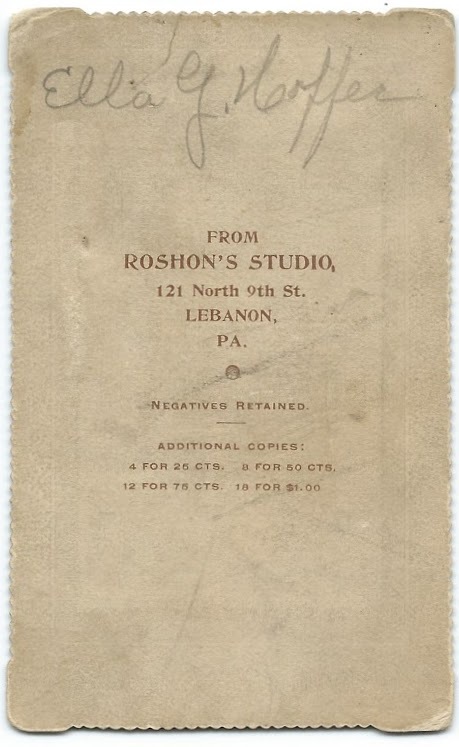 Libby E. Heyman; shared the page with "Blondy & Tippy"; Ed Rothstein; E. J. Heyman; and May Ola Johnson, who wrote her name in the center of the page. E. J. Heyman [possibly Edy J. Heyman]; shared the page with "Blondy & Tippy"; Libby E. Heyman; Ed Rothstein; and May Ola Johnson, who wrote her name in the center of the page. H. A. Lively, signed "1/1/81"
Ed Rothstein; shared the page with "Blondy & Tippy"; Libby E. Heyman; E. J. Heyman; and May Ola Johnson, who wrote her name in the center of the page. W. Russell of Welland, Ontario, Canada, signed in July 1882; shared the page with A. Stratton and May O. Johnson, who wrote her name in the center of the page entitled "The Three Orphans". 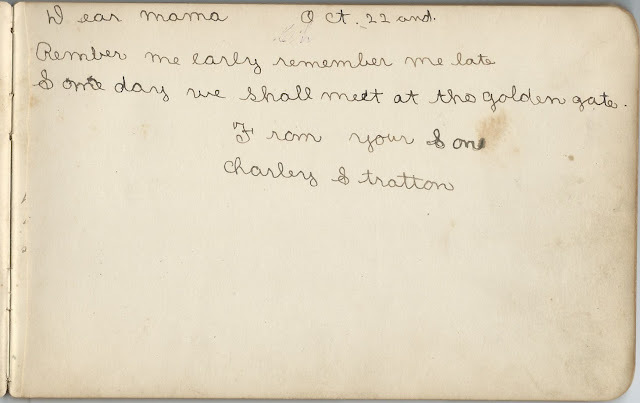 A. Stratton [who would become May's husband]; shared the page with W. Russell and May O. Johnson, who wrote her name in the center of the page entitled "The Three Orphans". 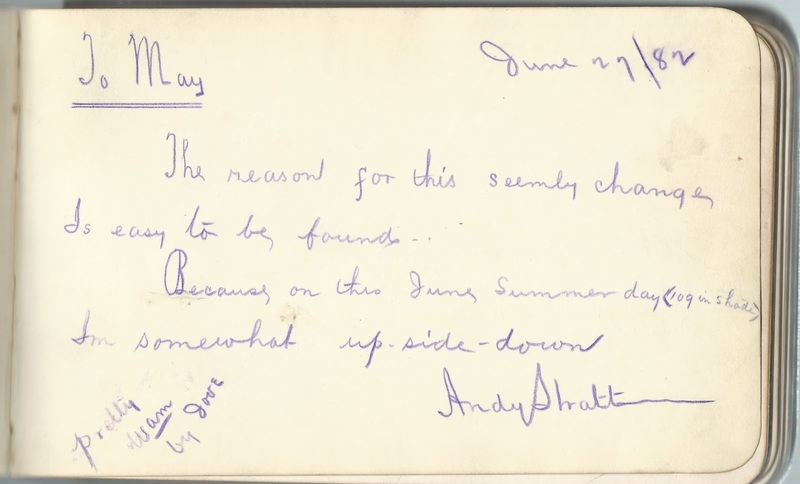 Written upside down: Andy Stratton, signed on June 27, 1882. Andy would become May's husband in 1891. 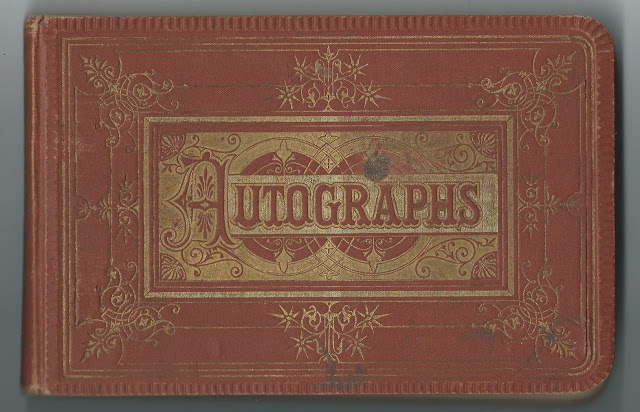 He inscribed another individual page as well, the last in the album. W. M. Tuckwell of Ivesdale, Illinois, signed on "7/12/80"
W. H. Tyrrell, signed at Ivesdale, Illinois, on "5/8/82"